We've been shortlisted at the Digiday Media Awards Europe in the 'Best Custom Advertising' category! 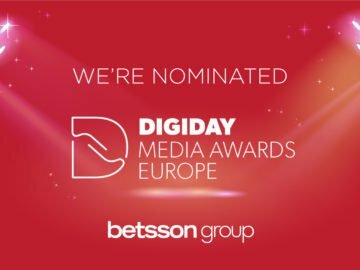 We’ve been shortlisted at the Digiday Media Awards Europe! We’ve made it to the ‘Best Custom Advertising’ category with the innovative AR Football Experience campaign we did with Bonnier News Brand Studio for the World Cup, which allowed users to build their own football stadium anywhere they wanted to. Kim Ekelund, Head of Maketing for Sweden said, “The World Cup in Russia was by far the biggest betting event of the year with a staggering €136 billion in turnover during the tournament and for the betting brands, a next to impossible job to break through the massive marketing investments across the globe. Betsson and Bonnier News Brand Studio decided to offer customers a new experience, add an extra entertainment to the World Cup and push the limits on how to experience live sports with the help of AR. We developed an intuitive and innovative second-screen solution that integrated our product and added value to the user which was very much appreciated by both old and new Betsson customers throughout the tournament. Look at our open vacancies to learn more about how you can work with our amazing marketing team.